August 5th, 2002 was a tough day for us Laker fans. That’s the day you left us after succumbing to a head injury you sustained falling on the stairs of your Encino home. 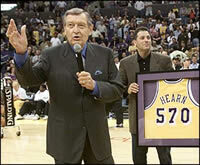 As Larry Stewart, sports writer for the Los Angeles Times, says, in L.A. you’re “as big a name as Jerry West, Wilt Chamberlain, Elgin Baylor, Kareem Abdul-Jabar, Magic Johnson, James Worthy, or Shaquille O’Neal.” We believe you were the best play-by-play basketball announcer of all time (the only one the L.A. Lakers have ever had), and we will miss you. From November 21st, 1965, to December 16th, 2001, you never missed calling a Laker game which means you called 3338 consecutive games, By comparison, Cal Ripken’s game streak was 2478, and A.C. Green’s only 934. As you can see, no record comes close to yours. Of course, we’re not the only ones who think you’re great. During your tenure here in L.A., you won two Emmy Awards doing a nightly national broadcast on CBS radio, the 1988 Cable ACE Award for “Best Sports Play-by-Play,” six California Sportscaster of the Year Awards, a Golden Mic Award, three southern California Broadcasters Association Awards for “Best Television Play-by-Play,” a star on the Hollywood Walk of Fame, and a place in the Basketball Hall of Fame. One thing we’ll miss for sure is your sense of humor. Even your partner Stu Lantz says, “You never know what he’s going to say. Every game, he comes up with something.” When the Lakers game in Chicago was delayed and you had to fill twenty minutes, for example, you entertained us with one-liners like this one, “Isn’t that the way it goes? You plan everything and then the turkey burns.” As one reporter put it, you may not always be the most polished broadcaster, but you’re the most entertaining. But, by far, what we’ll miss the most are your chick-isms. A player doesn’t miss a series of shots; he “can’t throw a pea in the ocean.” A player doesn’t put the ball in the hoop; he makes a “slaaaaaam dunk.” A player doesn’t miss the hoop entirely; he has an “aaaaair baaall.” And, of course, our favorite chick-ism is your closing ritual once you’re sure the Lakers have won, “This game is in the refrigerator. The door is closed, the lights are out, the eggs our cooling, the butter’s getting’ hard, and the Jelloooo’s jigglin’! !” We just can’t believe we’ll never hear that one again. Thank you for all you’ve done for us and for the game. We can’t believe you’re gone, but we know you’ll be successful on this new journey.